Support is provided by stiff material inside the brace at shoulder height to increase compression and limit movement of the joints. BT Lux works with your dog to gradually regain motor function. The comfortable padding combines practicality, convenience and optimal stabilization. The brace simultaneously compresses both shoulders. 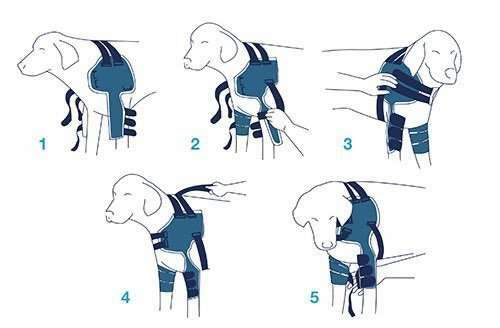 During the period of constraint, it is advisable that the dog not be left alone for long periods of time as it might try to remove the brace by biting or scratching it. The length of all of the straps and closures can be adjusted for a better, tighter fit to the dog. Available in three adjustable sizes. There are two straps between the elbow joint braces that can be used to bind the two joints together. NB: this solution is only required when used post-operatively or in case of serious disease that requires greater limitation of movement of the anterior joints. If there is no need to bind the two elbow braces, the safety straps can simply be neatly closed upon themselves.